Call it what you want, but the Caps at 7-0 matters. The argument stands that Washington can go 82-0 and it wouldn’t matter because of their postseason history. However, the point is not to gawk at their record. As mentioned in my last piece, the Caps’ progression through the season by the victory over the Florida Panthers has shown that the team is already overcoming some humps that held them back the last few seasons. In Thursday and Saturday’s games, Washington’s progression continued as they defeated the Philadelphia Flyers, 5-2, and the Detroit Red Wings, 7-1. Taking advantage of opportunities was probably the number one thing that the Capitals could not master in past years. The Caps were finally able to take control of in-game situations and momentum. The Detroit Red Wings were the least penalized team in the NHL going into Saturday’s game with the Caps. One would not expect to receive many offensive opportunities considering the Red Wings’ defense, goaltending, and their decent penalty-killing. Nonetheless, the Capitals were able to draw four penalties on the Red Wings — four careless penalties — and scored on half of them, adding two more goals to the seven-score the Caps put up. It certainly doesn’t hurt that usual power play quarterback Mike Green seems to have regained his offensive strength, scoring a team-leading three goals with the man-advantage. In fact, Washington has gotten significantly better overall at extending offensive opportunities and maintaining pressure by being able to keep pucks in the zone. The proposed second line of Alex Semin-Marcus Johansson-Mike Knuble has been the most successful line creating and converting on 5-on-5 scoring chances, hitting almost at a 60 percent conversion rate. Regarding discipline, the Wings were the least-penalized team in the league. The Capitals, surprisingly, were the second least-penalized team going into Saturday night. Against the Flyers and Red Wings, the Caps only committed four penalties in each game, respectively. Having had issues in the past with taking too many penalties and taking them in an untimely manner, this certainly is a good sign going forward for Washington knowing that they can be disciplined, giving them more focus on creating chances and making more solid decisions defensively. Prior to the game against the Red Wings, there was much talk about combating their special teams units. Bruce Boudreau spent a good amount of time focusing on working with the power play the previous practice then, knowing that was a sore spot for Washington last season and in spots for a few games this year. The end result was a mobile, striking power play that converted on half of their opportunities and added more to the already-strong 5-on-5 offensive coverage. The fact that the Capitals practiced to prepare for opponents like Detroit shows that Boudreau himself is developing as a coach (relatively, coaching five seasons in the NHL, he is probably still finding what he wants to do as an NHL coach). Last season, there was much ado about his lack of matching up against opponents, but here, the preparation and thinking-processes would bode well in situations like last season against Tampa Bay in the second round. Goaltending was not much of an issue last year, but it certainly is helping to notice the improvements in net from the beginning of the year. We all witnessed the “hot mess” that was Tomas Vokoun’s Capitals debut against the Tampa Bay Lightning where he cost his team some goals, but redeemed himself by the end of the game through overtime in the shootout. Since then, Vokoun has saved the Caps and kept them with leads, and even earned himself a shutout. Whenever Michal Neuvirth gets healthy again, there will be more cushion at the goaltending position. What’s also comforting for folks in Washington is that Vokoun has been solid under different conditions. In his shutout against the Panthers, he faced only 20 shots, whereas the last two games Vokoun saw 42 against the Flyers and 33 against the Wings. Of course, the run support in front of him doesn’t hurt his confidence and performance. Speaking of run support for Vokoun, the Caps have seemed to have no issue scoring at will all year long, especially in the last two games, outscoring opponents 12-3. The top line of Alex Ovechkin-Nicklas Backstrom-Troy Brouwer (originally with Knuble on the top line for the first two games) is not the only source of scoring for Washington. Backstrom leads the team with 10 points and Ovechkin is tied for second on the team with seven points alongside Dennis Wideman. 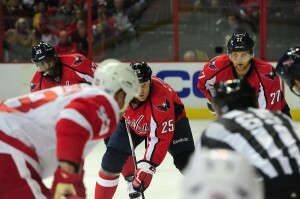 However, the top goal scorers so far have been Jason Chimera and Johansson. In the Caps’ scoring surge, even less-expected players like Mathieu Perreault and Joel Ward have been able to get a few pucks in the net and create opportunities. Finally, Washington is paying the price that it takes to win. Against the Flyers, Brooks Laich took two high-sticking penalties. Mike Green took a puck off of the face against the Red Wings and returned in the second period. The Caps are in the top ten in hits and have more blocked shots at this point of the year than they did last season. The Caps are doing the little things that help save games. When they lost in the second round to the Tampa Bay Lightning last postseason, Washington seemed hesitant to make that adjustment to their physical game, or to get down and block that shot or pass that eventually would make a difference in the game. This year’s Caps, even as early as it is, seem more ready to make such sacrifices in the best interest in the team. Overall, the Capitals seemed to have found a way produce these elements in their game a lot more consistently than last season. Last season, the team was quite an enigma — never knowing what you would see from the Caps in a given game, regardless of opponent. Even during the team’s nine-game win-streak last season from late Feb.-mid-March, the Caps never looked convincing in their performances, with the exception of a 5-0 victory over the Edmonton Oilers. Even then, they would come out flat in some periods, score two goals in one period, and then sit on it until the game ended (the streak ended after a 3-2 road loss to the Wings). Granted, Washington struggled with offense and showed the most passive forecheck throughout the entire year. But this season, the wealth has been spread through all periods, and the Capitals have done this for at least a longer stretch of games than last year. Consistency never hurt anyone, after all. Also, Washington has shown such improvements against a variation of opponents as well, taking their talents against the Panthers, Flyers and Red Wings. Last season, the Caps often played down to teams they were significantly better than, at least on paper. With the belief that they could just turn it on for the playoffs after resting up in the regular season (the regular season that apparently doesn’t mean anything), they were able to take the New York Rangers in the first round, but could not adjust to the Lightning. Having the ability to win strong every night (of course, not by 5-2 and 7-1 all the time) would be something the Caps will be able to carry over into the playoffs. I understand the nervousness involved in believing that the Caps’ solid performance through seven games means anything. Nothing the Caps have done requires awe, of course, and it’s not entirely new. They also haven’t done anything in relation to the rest of the league and any other team historically. But for a personal record, it isn’t a bad idea to keep note of their early season success. It is a justified reason for good news in Washington.